This was stitched on a piece of 28 count evenweave from a Crafty Kitten grab bag. 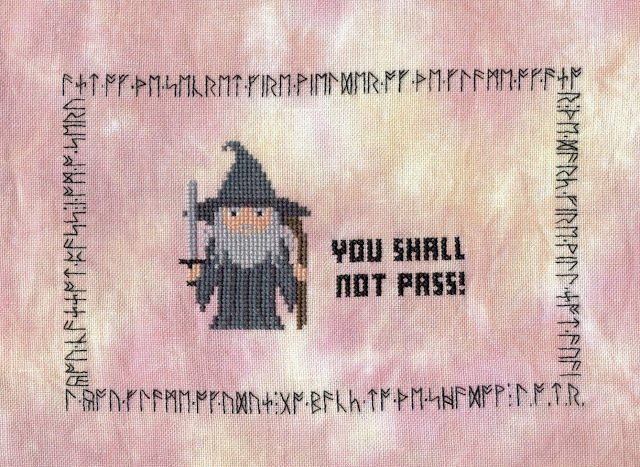 For those of you who wondered, the runes spell out Gandalf's speech while facing the Balrog on the bridge in the Mines of Moria - "You cannot pass. I am a servant of the Secret Fire, Wielder of the Flame of Anor. The Dark Fire will not avail you Flame of Udun. Go back to the shadow. L.O.T.R."